Since we may not be using our gardens as much during the colder months as we have in the summer, it is especially important to take steps to look after any visiting wildlife. In the harsher months, birds struggle to keep their energy up and remain warm. Fatty foods can help with this, so one important thing you can do is to leave out fat blocks in wire cages. You can make these from a block of lard, packed full of bird-goodness: fruit, seeds and dried mealworms. For smaller birds, such as wrens, search your kitchen for scraps and scattert finely chopped unsalted bacon rind and grated cheese. Some ground-feeding birds fail to find food due to the frost, so place seeds or fat balls on a wire mesh just off the ground to help them. When temperatures begin to drop, ponds and other water sources quickly freeze over. Since these may be the only water outlet for birds to drink and bathe in, their hydration and hygiene is at risk. Leaving out a dish of water, or even an upturned bin lid with water in, is the simplest solution. Then, as winter comes to an end, clean out your bird boxes so they are ready for the new breeding season. Usually nocturnal creatures, when hedgehogs are spotted during frosty days in gardens and through the streets, it’s a sign they are weak and struggling to find sufficient food and water. Leaving out a dish of water can prevent their dehydration, and providing meat-based dog or cat food will help feed and fatten them to keep their energy up for wintertime. As bonfire night approaches, too, make sure that you check piles of wood and twigs for hedgehogs before lighting. 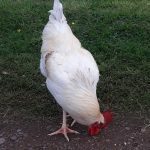 Many homeowners have chickens in their gardens or allotments. With frostbite and heavy rain, winter can prove troublesome for them. So, check for leaks in your coop and repair any holes with plywood, or if it is time for a new coop, purchase it from a good garden retailer. Be sure to insulate windows well in order to capture heat during the day and keep the coop warmer for longer when the dark nights arrive. Also, coating chickens’ combs and wattles in petroleum jelly helps protect them from frostbite. To prevent frogs from suffocating, float a tennis ball or something similar in your pond to stop it from freezing over. Leave your grass to grow long over winter and cut it again in the spring. This will let butterflies and insects shelter from the weather. Piling up rocks, twigs and rotting wood can create a shelter for insects who might not survive otherwise. By planting seed that will flower in the winter, you can provide a food source for bees that may be making their way to a nest. This winter, as you plan to cosy up on the sofa, think about your garden as a different kind of haven. Follow these tips and, hopefully, you will see wildlife thriving in your garden all year long. You’ll also be helping animals that may not be able to survive without you.